VLC Media Player is one of the most versatile and powerful media player available, where its major attracting advantage is that it can play almost every media files throw at it, as VLC Media Player has built-in codecs for almost every media formats. However, VLC Media Player has a major imperfection, that’s the lack of Chromecast support. Chromecast is a media streaming device in a small dongle format that plugs into the HDMI port on the HDTV, and instantly transforms the TV into a big screen for playback of Internet-streamed or locally stored audio/visual content. User can initiate and control the playback on a mobile device or personal computer on web apps that support the Google Cast technology, or mirror the content Google Chrome web browser running on a personal computer, as well as from the screen of some Android devices. Chromecast support in VLC Media Player will allow users to stream media contents that are playable in VLC Media Player to the TV directly. The developer on VideoLAN has been working on Chromecast support for a while, and the feature is expected on VLC Media Player version 3, which is currently under active development. While VLC Media Player 3.0 is still been developed, interested users can now download the bleeding edge versions of VLC Media Player and enjoy the Chromecast media casting for audio and video files, which is still in its infancy. VideoLAN publishes a new experimental build of VLC Media Player 3.0 every night in its nightly builds branch, and available for download by everybody for free. But do note that nightly builds are generated from the VLC code that is currently in development, so it does contain plenty of bugs, problems and issues. It can be seen from the Chromecast support, which is detailed in the this tutorial, which is unstable, and may or may not work on your system or for different types of media files, and failure to cast DVD and Blu-ray. In fact, the implementation of Chromecast in VLC Media Player is not polished and not so user friendly too, at least for now. Download and install the latest nightly build of future version of VLC Media Player 3.0 from http://nightlies.videolan.org/. Chromecast is currently available for Windows (32 bits) and Windows (64 bits) only, so if you’re using macOS, Linux, Ubuntu, iOS or Android, you can try to download and install to see if Chromecast support has been added to one of the nightlies. Turn on the Chromecast (by turning on the TV and/or power adapter for power to Chromecast, if applicable). Run the VLC Media Player 3.0. In VLC Media Player, go to Video (in the menu bar) -> Renderer, and enable Scan (tick will appear before Scan when enabled) so that VLC can start scanning for casting devices on the same network. Then, go to Video -> Renderer again, and select the Chromecast device that appears in the list (normally below <Local> entry) so that VLC can connect to the Chromecast. Open a video or audio file in VLC Media Player, and play the media. VLC will cast and stream media directly to the Chromecast for viewing on TV. The very first time you attempt to cast to Chromecast, an “Insecure site” prompt is shown. Click or tap on View certificate to display the Chromecast’s security certificate. And, select Accept Permanently so that VLC does not prompt you anymore until the certificate expired. 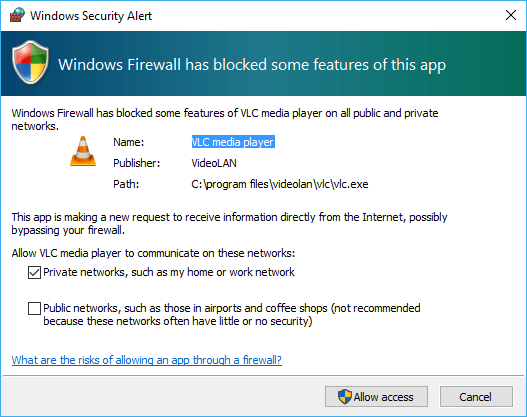 In addition, Windows Firewall may prompt you to it has blocked some features of VLC Media Player and asks you to allow VLC to bypass firewall and communicate with private networks. Click or tap on Allow access. Once VLC Media Player begins to cast the media to Chromecast, user can control the playback with the VLC, such as pause, rewind, fast forward, skip and etc.